This symbol was adopted as the state seal in 1858. The Minnesota Secretary of State is the keeper of the Great Seal of the State of Minnesota and affixes the seal to government documents to make them official. Just as people authenticate a document by signing their name to it, the state seal acts as the State’s signature. 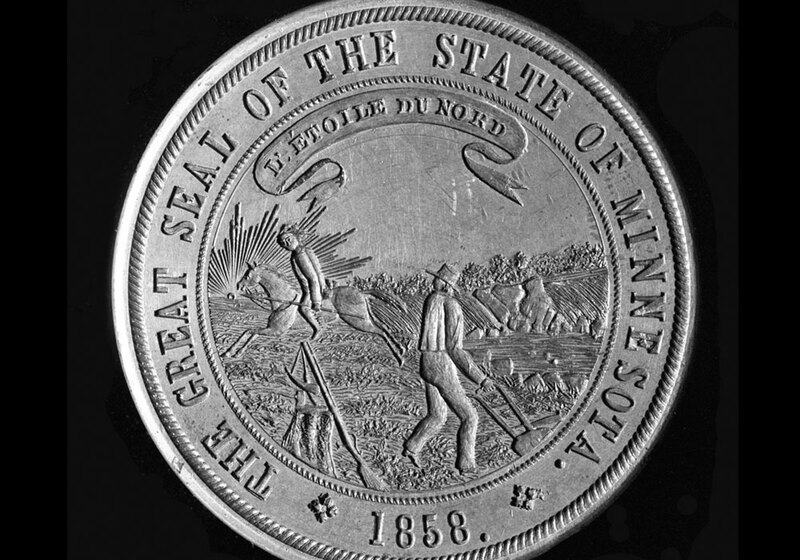 When Minnesota became a state on May 11, 1858, it did not have an official state seal—despite a constitutional requirement to have one. In 1861, the Legislature adopted the new design, making it the official state seal. In 1983, the Legislature altered the seal in an attempt to spell out specific design details more clearly in hopes of avoiding the wide variations that occurred in past artistic interpretations. The Great Seal of the State of Minnesota is rich in symbolism. The sun, visible on the western horizon, signifies the flat plains covering much of the state. The cultivated ground and plow symbolize the importance of agriculture. The Mississippi River and St. Anthony Falls are depicted to note the importance of Minnesota’s natural resources for trade and commerce. The three pine trees represent the state tree, the Red or Norway pine, and the three great pine regions of the state including the St. Croix, Mississippi, and Lake Superior. The tree stump symbolizes the importance of Minnesota’s timber industry. The American Indian on horseback represents the great American Indian heritage of the state while the horse, spear, axe, rifle, and plow represent important tools that were used for hunting and labor. Minnesota Statute 1.135, subd. 4 (1983 Supp.) states that section 1.135 does not "prohibit the enlargement, proportioned reduction, or embossment of the seal for its use in official acts." This suggests...that the private enlargement, reduction or embossment of the seal by private citizens is not prohibited.